Photo courtesy of Cuba Libre. Ok, he never lived in DC, but Papa Hemingway is still a favorite of mine, so we’re wishing him a happy birthday! Not for his writing really (though I did have to mimic his style several times at nerd camp, but that’s another story), but for his passionate love of the cocktail. Today at Cuba Libre there will be a special happy hour to celebrate his 112th birthday, held from 4:30-6:30pm with $5 Papa Doble daiquiris and $4 small-bites like salted cod fritters with lemon mayonnaise. Cuba Libre has been celebrating National Daiquiri Month at all their locations with a special $10 daiquiri menu in honor of Hemingway, in a promotion called “Do It Like Ernest.” Does that mean brawling and bull-fighting? Well, probably not, but it does include daiquiris and dishes with blue marlin and bluefin tuna as a toast to Hemingway’s prowess as a fisherman. That tuna is pan-roasted with a rum glaze, of course. The Papa Doble is a double of the Hemingway Daiquiri, created at the El Floridita bar in Havana by the “King of the Daiquiri” – Constantino Ribalaigua. Hemingway was a big fan of Ribalaigua’s daiquiris (he used to show up at the bar at 10am), especially #3, which was eventually renamed in his honor. Featuring white rum, grapefruit juice, lime juice, and maraschino liqueur, it’s just the right balance of smooth and tart. 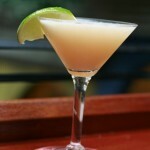 Hemingway was not a fan of sweet drinks, so if you aren’t as well, this could be the daiquiri for you. Remember Hemingway was a conservationist and skip the bluefin, please: http://www.bluefinboycott.org. Atlantic bluefin populations have declined 80% since his fishing trips. Thanks for the info, C. It’s good to know.